I have been sidelined for a few weeks now. My beloved Accord, or the “Waterfallmobile” began crying for help. It seems this spring and summer have been hard on it. Lots of falls, many a trail this ride has delivered me to, never with a complaint. Not even the steep winding dirt roads, that some of my state’s more elusive attractions require navigating to could slow it down. But… the day came when it said …..enough!! It seems my travels prematurely wore the tires down and they needed replacing, immediately. Unfortunately my car requires a size that is rather costly! I’m happy to say that it now has the tools needed to climb many more mountains. Saturday was its first trip out in awhile and it was a great one. I didn’t really have a game plan of trails to hike, or waterfalls to see, just a rough idea mapped out in my mind that could change at any place along the way. I just wanted to get out, back to my favorite place, the NC Mountains. After the required drive to Asheville, and a good breakfast, it was time to see some waterfalls. I wanted to see at least one new one, or new to me on this day, maybe more. 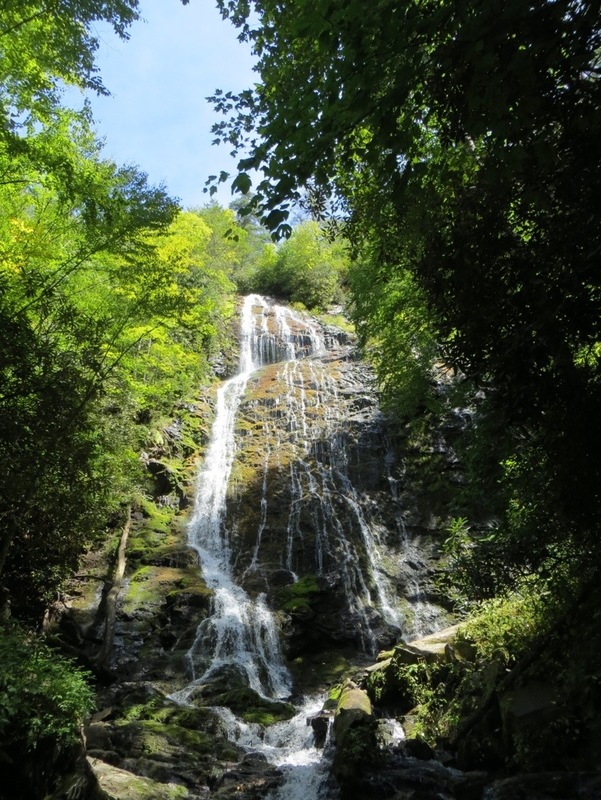 Soco Falls, close to Maggie Valley was the first one on the list. Just south of its junction with the BRP on US 19, sits Soco Falls. 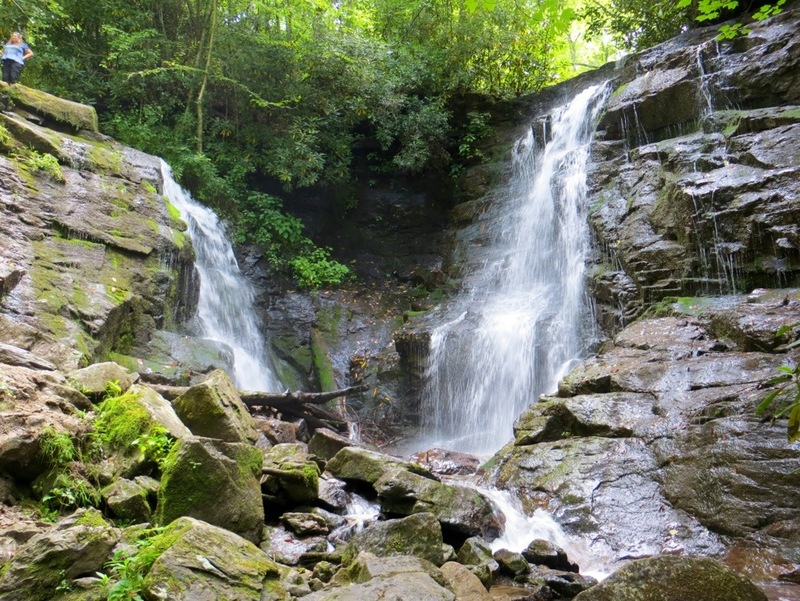 Soco Falls is a confluence of two streams coming over the same drop of about 50 feet. It made for a beautiful setting. The trail to get there is very short. It’s just down hill from the highway that is in process of dropping down the mountain at the pull-off. In just a short distance, there is a fine, well made viewing platform deck. The problem here is that you only have a view of the bigger fall. The other one is hidden. The trail does continue to the base….sort of. It gets very steep, and slippery below the deck, though not a long distance. 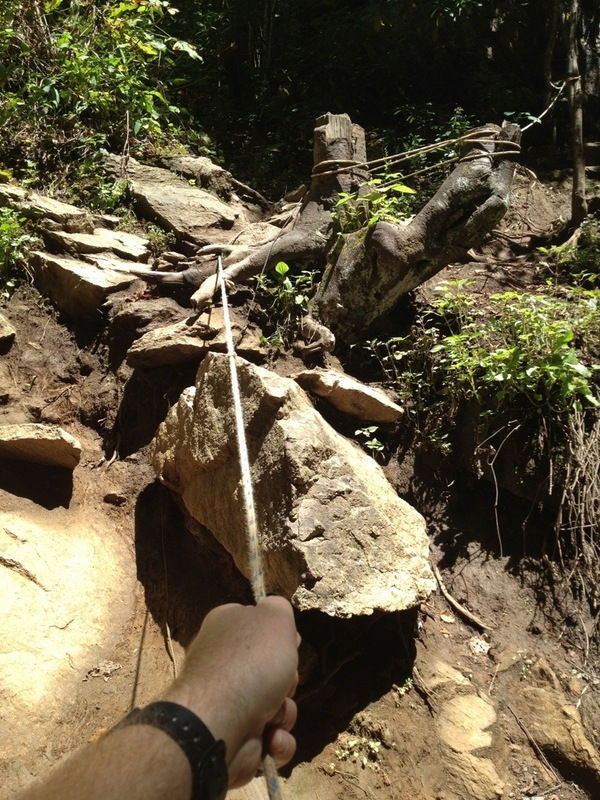 Some one has tied rope in strategic spots to assist with the descent from here and the climb back up. It worked well, but still be careful. 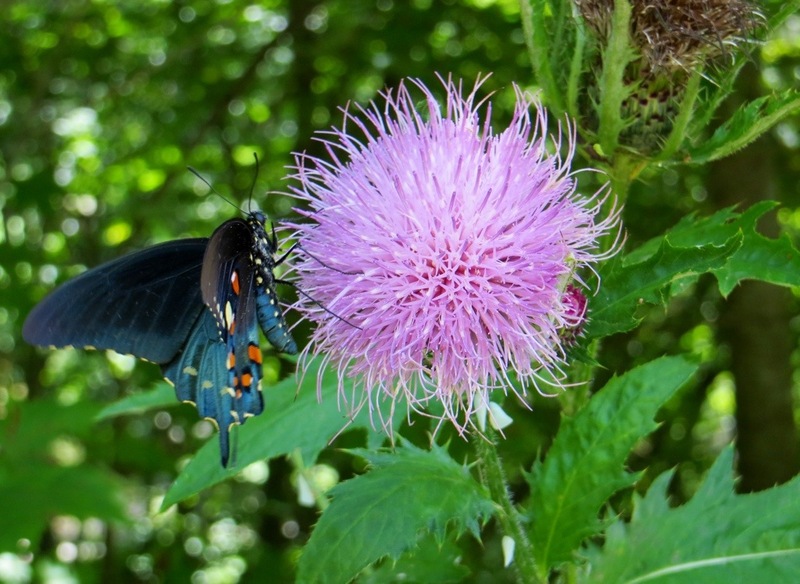 On the way back to my car, I passed a patch of milk thistle, that was covered in butterflies. 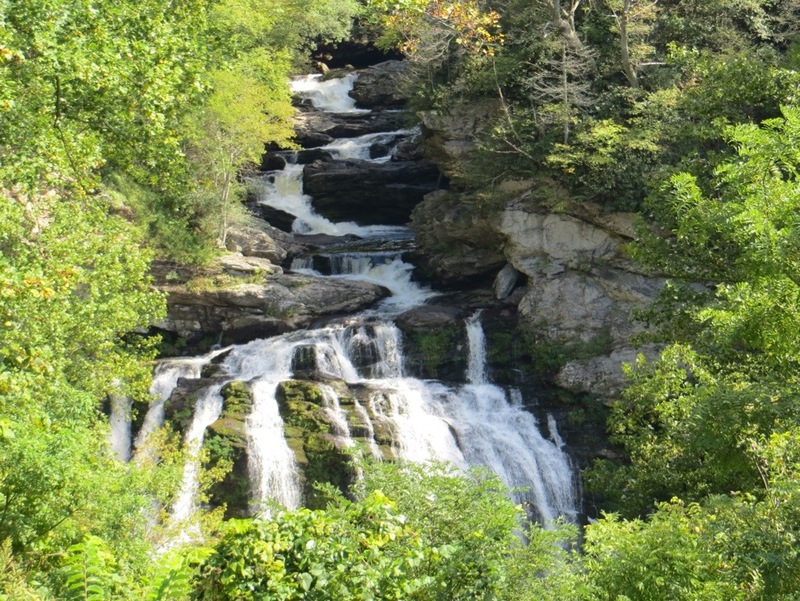 I was able to get a shot or two in..
After Soco Falls, I knew from where I was that Mingo Falls was close by. 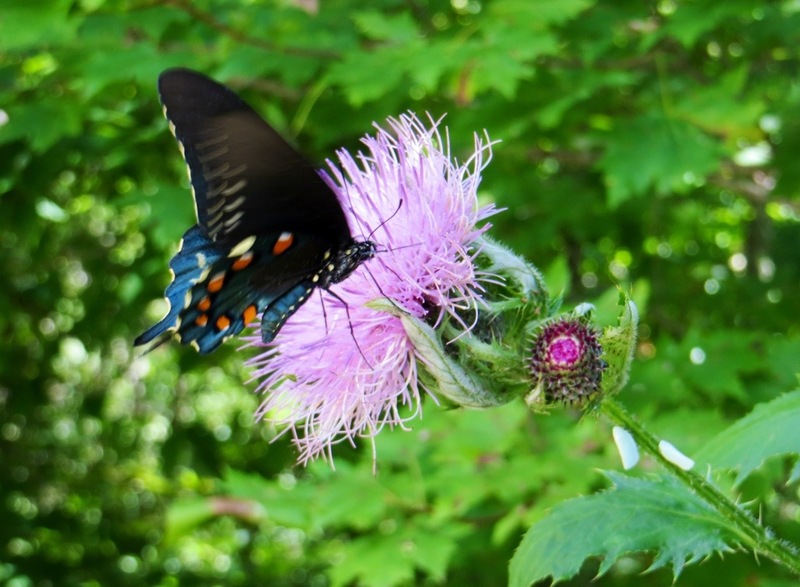 A short drive down the final 14 miles of the Blue Ridge Parkway, puts you right in Cherokee. I have been to Mingo Falls twice already this summer, and do not have a photo I am satisfied with. After my third visit, sadly, I still do not. The sun was shining on half of it, and the water level was way down. 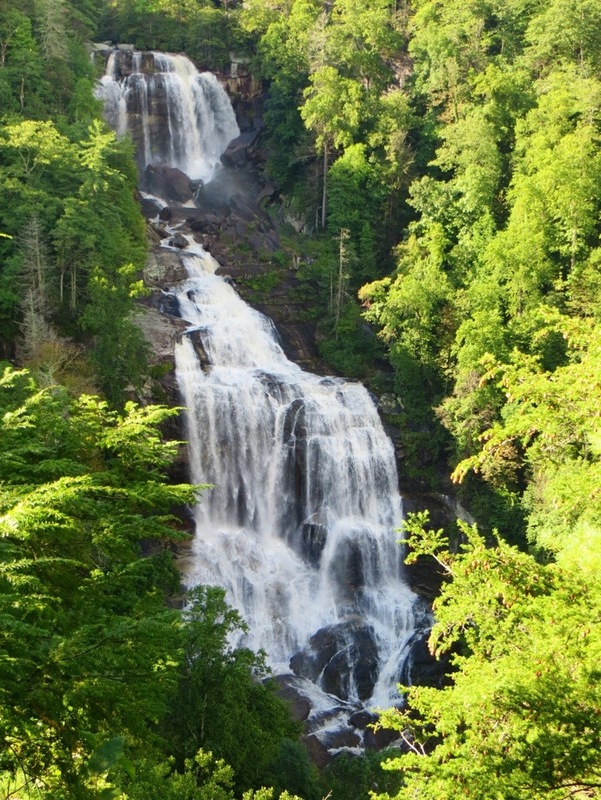 It is still a magnificent waterfall that I have seen listed at 120 ft and 200 ft. Either way, it’s tall, and the hike to it is just 1/4 mile, up steps to a bridge that makes a great spot to take pictures. Notice the moss growing on the cliff. When the water is higher, all of this is water and an impressive sight. Maybe my 4th trip,I can apply what I have learned and get a good picture…maybe. Next, was some driving down US 441 to the Franklin area, then pick up US 64 and drive up into the Cullasaja Gorge. This is one rugged gorge. The driving of US 64 through this 7 mile stretch seems about as technical as hiking the Grandfather Trail on Grandfather Mountain at times. It is amazing that they were able to get a highway all the way through this thing. It has also been recently repaved, which made for a more pleasant drive. First stop here was Cullasaja Falls. At 200 ft, this river makes one impressive final plunge. There is no hike required to see it, however, viewing this waterfall is still quite a challenge and very risky. The pull-out is very small, 2-3 cars max and is in the middle of a curve on a US Highway that cars have no idea of your presence as they enter. The repaving has helped here, as there is a tad more room to pull off. Being September 1 created a new problem, weeds. They were so high, that most of the lower drop was not visible. It’s always something….I guess. The water level was perfect for the “fingers”, that the lower falls seems to show, but to see this one in its entirety, I guess I will have to wait for some frosty nights. There is a steep scramble path the base. I did this back in the 1990’s, but the view is obstructed down there, as you can not see above the final plunge. Plus it is a beast of a hike, and many cars usually want to stop here for a photo. It’s best to get your shots and get moving. 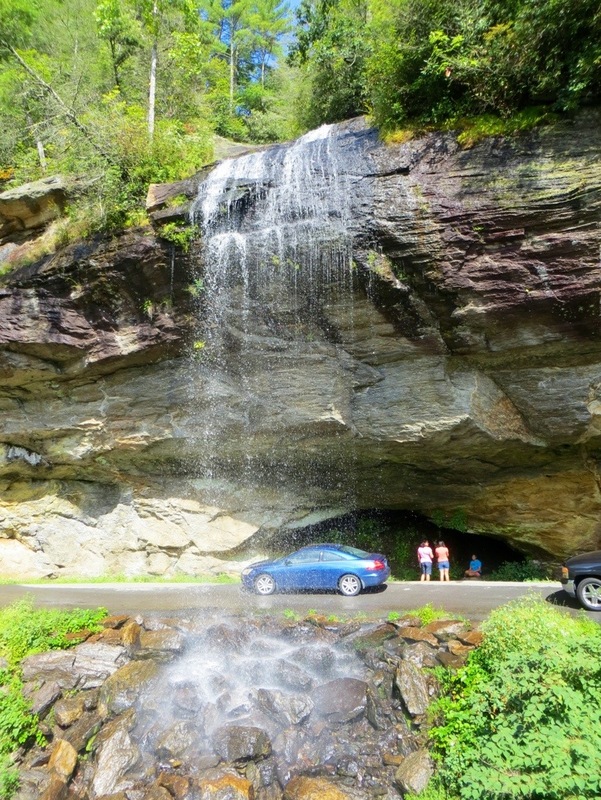 A few miles, and many curves up US 64, brings you to a spot known as Quarry Falls. 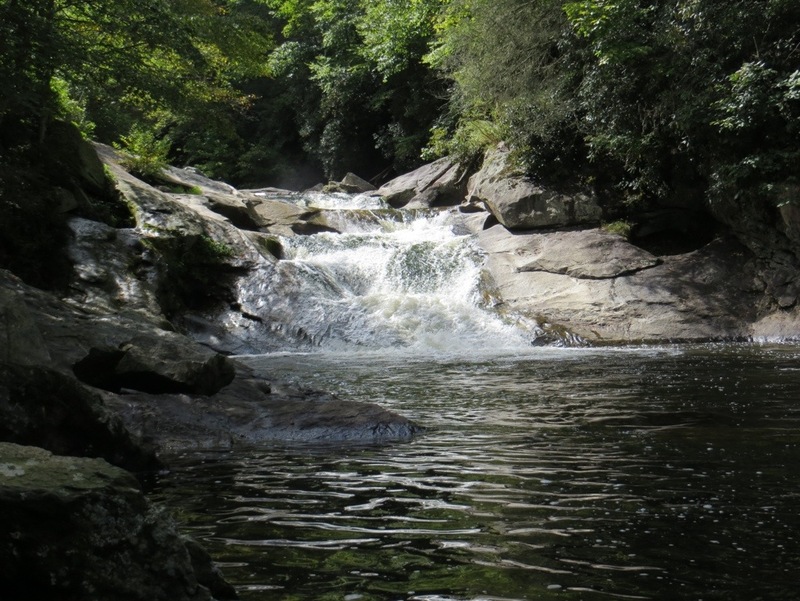 At 20 feet, height is not the attraction, but the large swimming hole, large boulders in the river, and multi-tiered falls makes for a beautiful setting. Pictures are better from the other side of the river, I just wasn’t prepared to get there on this day. My next stop would be to one of my favorite waterfalls on earth…..Dry Falls. Dry Falls is a gorgeous spot where the river spills over a wide ledge that juts out, creating a wide path that you can walk under and stay dry….hence “Dry Falls”. Much to my disappointment, this attraction is currently closed do to reconstruction of the path and parking area, so no photo. I have plenty, but since i did not see it on this day, we will leave it out. Here is an idea….take these funds, and create a better viewing area for Cullasaja Falls downstream. Dry Falls is just fine, but getting a photo at Cullasaja can potentially cost you dearly. 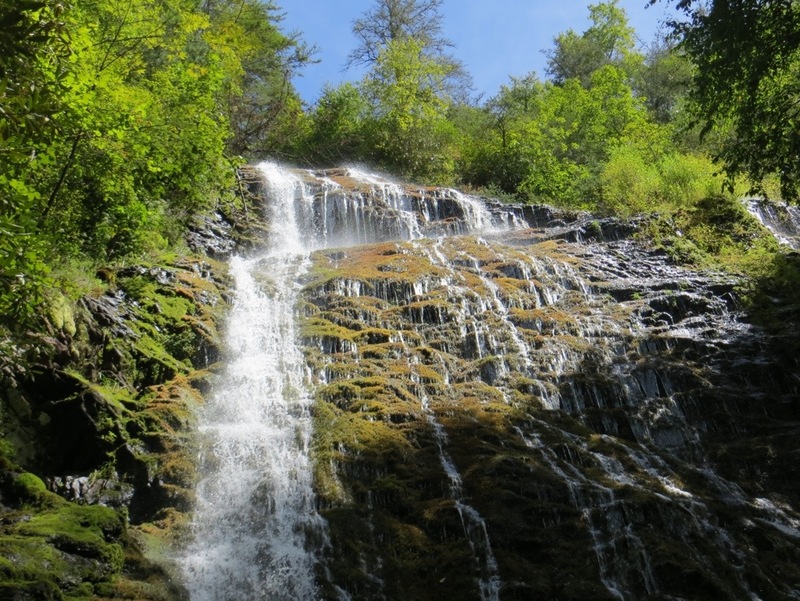 Just up from Dry Falls is another very popular attraction, Bridal Veil Falls. 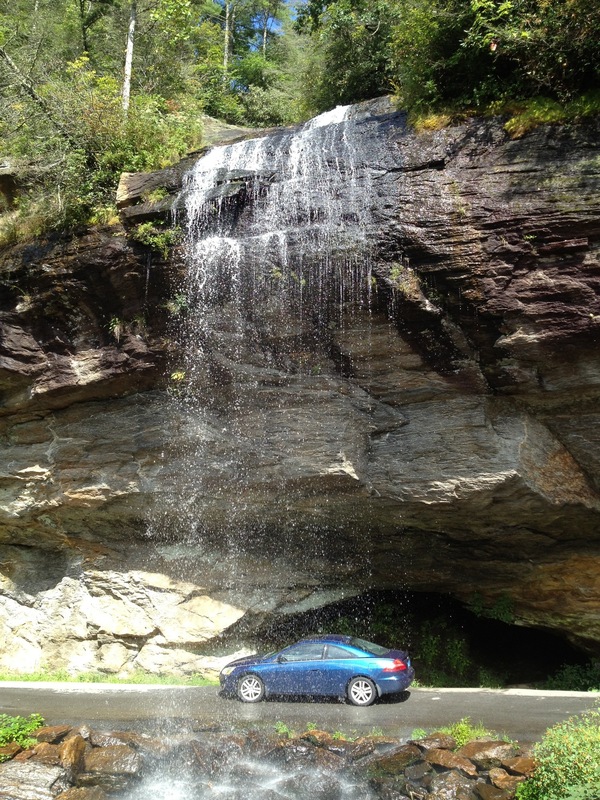 Bridal Veil Falls is the only NC waterfall that I am aware of that you can drive your car under. This is not on the Cullasaja, but a small tributary stream of it. It is roadside, so no hike is required. Actually, US 64 used to run under it. Now, it passes just by it, but you can still pull out and drive under it. 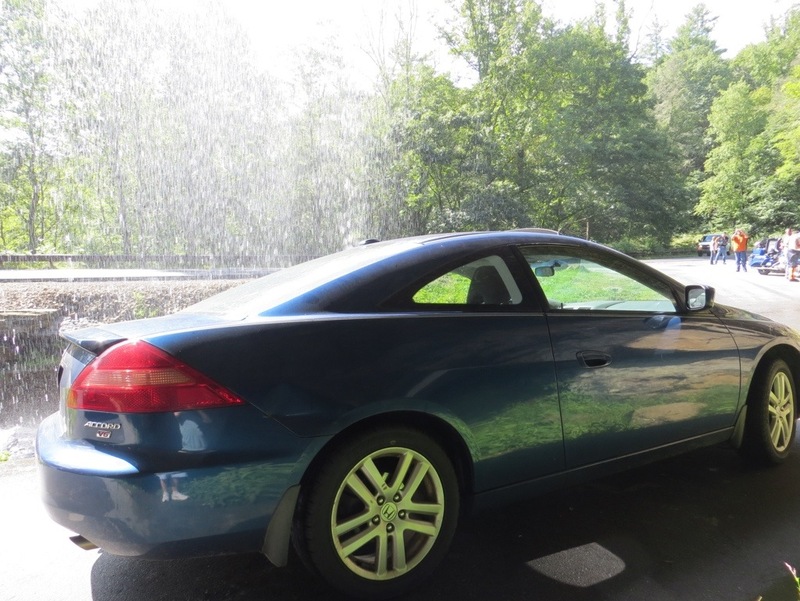 Here is the “Waterfallmobile”, back in action, parked under a waterfall and happier than ever! It was now getting late in the afternoon, and I was a long way from home, so I began my trek east. My plans for seeing some new falls at Pantertown Valley, and hiking nearby Gorges State Park would have to wait until another day. I often have more places to go and things to see than i have time to do it. I did have time for one last stop at one of my favorite spots, White Water Falls. This was just a short distance off of US 64, about 9 miles south on NC 281. 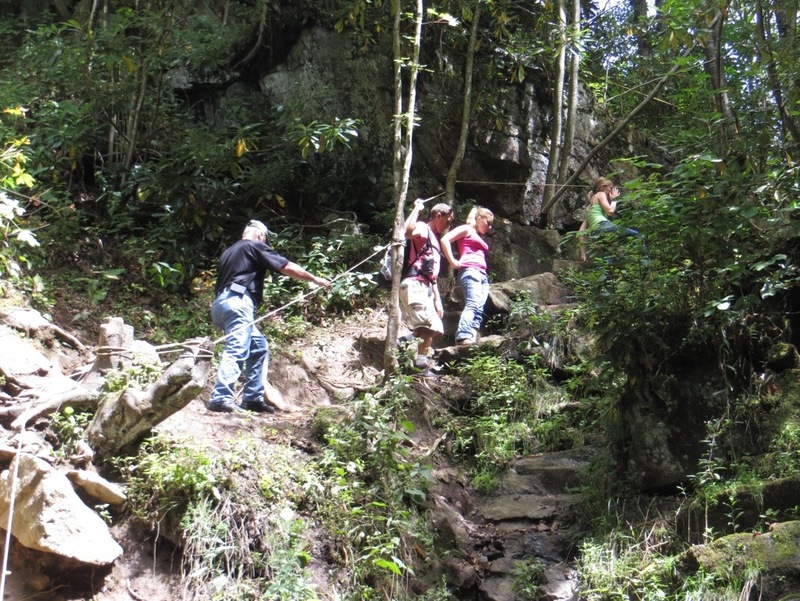 The hike is short at only 1/4 mile to the tallest waterfall in the east. It is a high volume water fall in a pristine setting. The distant roar of this waterfall can be heard from the parking area. The viewing platform provides an excellent view of this, even though you are still quite a distance away. My photo will show the sun at its low angle here, making my photo dark. It is a shame, because the water level in the river was up today, showing its true power. White Water Falls is truly breath taking. It is a must see and only then can you truly appreciate it. It is not just another waterfall. So it was home from here, this was a great day, for me and the “Waterfallmobile”!! Stunning photos! I love waterfalls. I’m so glad I found your blog. I will enjoy reading your posts and seeing your beautiful pictures. Thank you for sharing! Thank you very much! I certainly enjoy visiting them and also enjoy sharing them. Thanks again for the kind words!